Women are frustrated. The social myths of the past 5,000 years have locked women into roles and expected behaviors that are ill-suited for a 21st century female life. The new freedom that women experience does not just come from their own desires but also from the prolonged adolescence of 21st century men that are forcing women to become more emotionally and economically independent. The social expectations of men to be established primary breadwinners and husbands and fathers by the time they are 30 are long gone. Today, 50% of 33-year-old males have never been married and seem to be enjoying freedom without responsibility quite nicely. New research indicates that dating apps, which vastly increase the opportunity for casual female companionship, are relationship commitment killers. What all this means in the world of work is that as women reach their 20's today, they do with the expectation that they need to create a full, independent career that will give them economic security and fulfilling opportunities. That's the way it is. And it's positive in that more women are discovering and expressing their true talent and desires than ever before. But here's the problem. Most women feel very disadvantaged in achieving their career goals because they work in male-dominant cultures. As Northwestern University's Dr. Alice Eagely points out, "we admire power seeking, ambitious males and forgive them for their faults. Yet, we distrust power seeking females and are suspicious of their nature and question their competence." I am fascinated by her insight that ambitious females are subconsciously "questioned for their nature"...like what kind of woman are you? Sadly, I have found that she is right. When I talk to male managers and professionals privately, they tell me it is hard for them to sustain open-minded listening and consideration of important ideas coming from a strong female. Women are he-coached to lead like men, but when they try to, they are not supported. This problem does not arise from mean, uneducated, or even insecure men. These are simply the subconscious norms most of us have adopted about women's roles and behaviors of the past. Remember, for thousands of years most women have been dependent on men for economic security and physical safety. The power that gave men over women leads us to the Harvey Weinstein's of today. But everything is changing now. I just returned from India where the daughters of semi-literate village women are literally becoming high paid computer engineers. In one generation, a 5000-year-old culture is shifting due to the education of women. All that is good, but so many women ask me what can they do today to increase their influence, and impact in the archaic, authoritarian companies they work in. One thing that doesn't work is wishing for an instant change in subconscious attitudes that have been ingrained for thousands of years. Harvard researchers, John Neffinger and Matthew Kohut, have identified that all of us, men and women, tend to trust women that are warm, as well as strong. And conversely, we tend to distrust women who are only strong, but don't exhibit much warmth because it seems to be against the "nature" of how women should act. Of course, it's true that while we might respect strong women, most of us are psychologically uncomfortable working with them. Men, on the other hand, don't have this requirement. I know...it's not fair. But it starts with toddler age boys and girls. Research on early childhood development reveals that both parents and teachers are much more accepting of aggressive behavior of boys than girls. This double standard persists for the rest of our lives. In the workplace, the figure above tells the story. Women struggle to be accepted as leaders because if they are too strong, they will often create passive aggressive resistance. But if they're too warm, team members are likely to translate that into softness and eventually weakness. Either result limits their leadership impact and diminishes their authority. 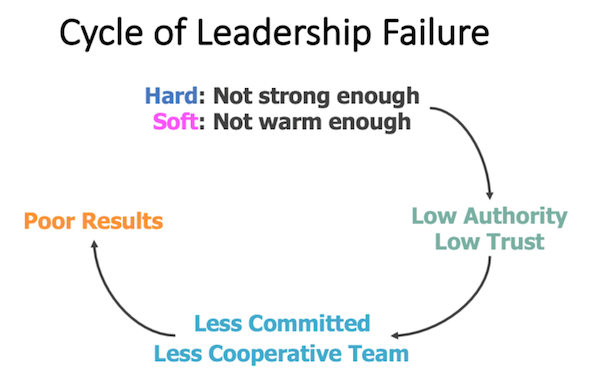 This, of course, undermines teamwork and accountability, which leads to poor results. But describing the problem doesn't solve it. So, I've developed a simple list of skills you can use to communicate both strength and warmth. Please do not view these as manipulative "tricks." Instead, see them as skills to expand your emotional intelligence. 1. Get clear and stay calm. A woman who is clear on what she wants and stays calm and persistent can "melt rock." One way to project clarity is to describe the outcomes you are seeking using the "rule of threes." This means when you state a goal you say..."There are three objectives we need to accomplish," then concisely state the objectives. An example might be: (1) We need to improve our customer service scores by 10% in the next 90 days. In order to do this, we must (2) interview and re-train all customer service reps in the next 30 days. And (3) we must change the way we measure call-center productivity from efficiency to effectiveness. Please note that you communicate warmth when you use the pronoun "we" instead of "you"...we must, rather than you must. According to psychologists, calmness communicates confidence. And the way you demonstrate calmness is to keep your voice in a lower octave range, and speak slowly. So, any time you raise your voice and speed up, be aware you're probably communicating anxiety, which actually reduces your power. 2. When you are presenting to a group using PowerPoint or a handout, always stand up. A leader needs to "fill the room." I've coached many executive women to always stand when they're making a formal presentation, even if the men in the room make presentations while they are slouching in their chairs around the conference table. A couple of powerful psychological things happen when you stand. For you, standing up increases your metabolic rate, which gives you more energy. Standing gives you an opportunity to lean forward when making important points, which is known as the power pose. It also makes you taller than everyone that is seated, and height is associated with both confidence and competence. (That's why most CEOs are over 6 feet tall). 3. Always gain and train allies to support your agenda. In important meetings where decisions are being made, it is vital to have recruited vocal supporters. A vocal supporter is someone who will speak up in support of your ideas, even in the face of opposition. In every meeting there are influencers whose opinions weigh more than others. Before a meeting you should ask the influencers who you have already recruited if you can call on them to speak up in support. You don't want to surprise him or put them on the spot if they haven't agreed to. Sometimes an unreliable supporter will sabotage your agenda if they feel the winds are changing. So, it's important to make eye contact with them before you call them. 4. Use business cases to influence change. The business case simply means that you have developed credible, positive, and financial outcomes that will come as a result of your proposal. Most business decisions are based on a potential positive financial result. So, if your proposal is to rearrange the office so more people can see outside, that has to be linked to increased productivity, engagement, and initiative. Also, it's important to portray all of your outcomes in graphs and charts; not numbers or excel spreadsheets. The reason is neurological. Graphic data is interpreted by your visual cortex which is less likely to trigger opposition than a list of numbers. Just try it, and see for yourself. 5. You can only change the status quo by predicting the negative financial outcome of not changing. This is called the cost of failure. In my work, I graphically portray a financial analysis of the annual cost of replacement of valued female talent and the cost of lower engagement as a percentage of overall women's payroll. 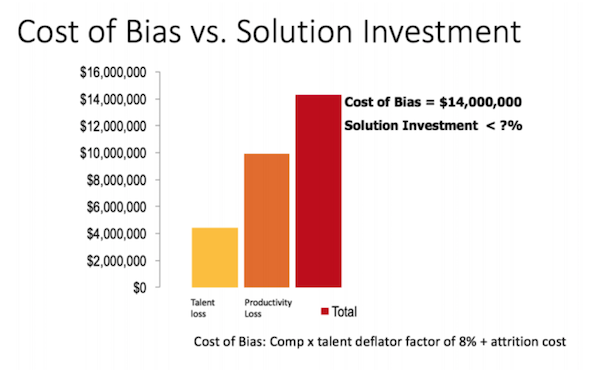 I don't defend it as an exact analysis but rather as a credible indicator of the cost of marginalizing talent. You can make a visual graphic of a financial argument for virtually anything you want to change. Internal financial analysts are often happy to get involved which lend needed credibility to your influence. 6. When people oppose, you can often neutralize their opposition by offering to do a complete test of your idea and measure the results. This makes you flexible, reasonable, and confident and puts them into a corner of just being oppositional. I have often started culture change projects by working with a single business-critical team or a function like finance or professional services that have wide cross-company impacts. Often, we can produce tangible behavior change with positive testimonials and cases in 90 days. Proof that the change that you advocate creates positive results increases your influence power and sets you up for promotion. There are several simpler skills and tools that I teach women and men who find themselves stuck in high-pressure, low power, career-killing situations. Once you realize that your culture is biased against your gender, your style, or way of thinking, you can use your emotional intelligence to outsmart it. I have found the best ideas to help companies grow and employees thrive rarely come from the top. They come from people who really care about customers and creating a quality of work-life that inspires great work. Authoritarian cultures usually value profit and dominance rather than customer value and employee engagement. I am inspired when I can help elevate organizations by increasing the influence of positive change makers. That requires a high degree of emotional intelligence and specific skills to improve and increase your power, and avoid getting caught in the vicious cycle of being shut down because you're too aggressive or ignored because you're not aggressive enough. Great, effective, and happy women leaders are both strong and warm. I am convinced of one thing: women will overcome the bias of authoritarianism because they will not give up...not this time...not ever.